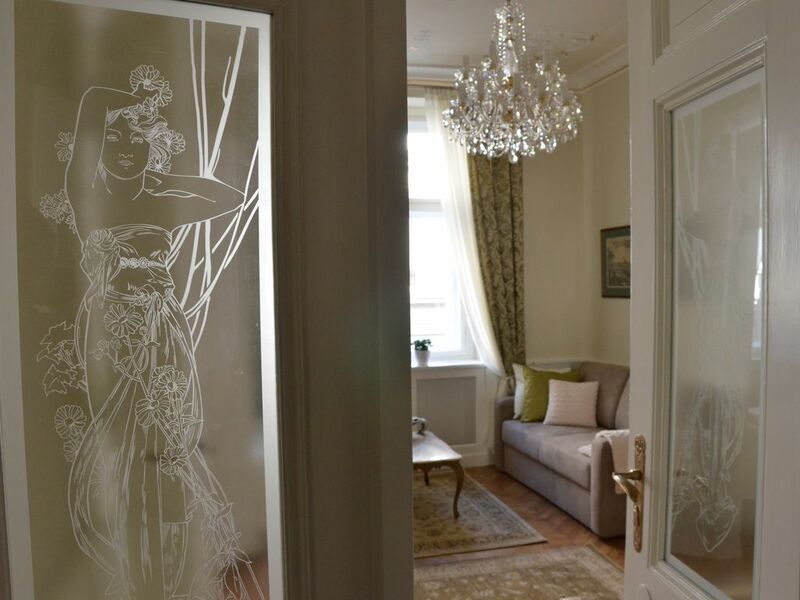 This newly renovated, fully-equipped 3-bed and 2-bath apartment on the 1st floor(2nd floor US) of a historical neo-gothic building just around the corner from the Charles Bridge is for up to 8 guests, and at the same time caters to a smaller, more demanding group or family that wants to have Old World style but in a modern, functioning flat. There are three connecting rooms: the master bedroom with king-size bed(180 cm wide), the living room/sitting room with fireplace(bio-ethynol means real flames but no smoke), cable TV, and a large pull-out sofa, and then the large bedroom with two king-size beds. These rooms all have their own entry/exit doors, so privacy is not a problem. The large master bathroom has a tub/shower, toilet, his and her vanity sinks, and a washer and dryer concealed behind a decorative side panel. The second smaller bath if also fully equipped, with a small sink, shower, and toilet, and both have heated floors. Complementary WiFi works throughout the flat. The fully-equipped kitchen is perfect for making large meals, or even just for a coffee and small breakfast in the morning. Iron and ironing board, all towels and washcloths, and extra bedding are of course provided. Smoking is not permitted in the flat, but we have a small balcony which is perfect for that. We think that you will appreciate the level of detail that Mark & Mirka put into the flat, from the choice of linens for the beds and selection of furnishings (we have two art nouveau chairs in the kitchen) to the extensive restoration of the ceiling décor and the matching chandeliers. We have really focused on trying to preserve and enhance as many elements from the original construction as possible. Mark Grein is originally from the U.S., but on a chance trip to Europe back in the nineties, he was enchanted by the magical allure of Prague and decided to set up shop here, right in the middle of central Europe not long after the Velvet Revolution. He and his wife Mirka are filmmakers, but decided to try their hand at renovation when they bought this beauty in the heart of the Old Town last year. They did much of the renovation work themselves, especially in restoring the original ceiling stucco decoration, spending many hours up on a ladder covered in wet plaster and paint. As with all properties, 'genus loci' is the most important thing, and this flat has got it in large amounts. It is the perfect place to begin and end a walking tour of the beautiful city, and the quaint street has many great cafes, fantastic wine bars and restaurants, and even though it's close to the famous bridge, it's managed to hang to a lot of its local character. We are located just a few minutes walk from the famous Charles Bridge on a quaint, historical street filled with cozy cafes, great wine bars, and tasty restaurants. We are in the heart of the Old Town, so it is the perfect base to go sight-seeing in one of the most beautiful towns in Europe.